Yorkshire rhubarb is at it’s best when forced to make thin pink stalks (once tasted you will never be forced to eat it again). It grows all around Yorkshire but is at its best when grown in a triangle between Wakefield, Ardsley and Ossett then forced in the low sheds built for the purpose. 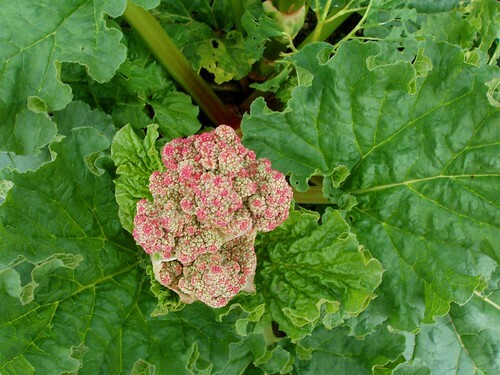 Your rhubarb will flower like this if you don’t eat it first! Ornamental varieties of rhubarb are not grown in the ‘Rhubarb Triangle’ as rhubarb is a serious crop grown under strict conditions to produce thin pink stems from February to make into delicious pies. The rhubarb triangle is not a gardening device but a geographic location between Wakefield, Morley, Dewsbury and Rothwell where the majority of the worlds supply of forced rhubarb is grown. The rhubarb grows in forcing sheds while it is still winter and is ready before your garden crop grown outdoors. You can force your own garden rhubarb by covering the crown of the plant with a large pot filled with loose straw to keep it dark and warm. There is a book of Walks in the Rhubarb Triangle ‘It includes delicious recipes from Barbara Bell for rhubarb bread and butter pudding, rhubarb cheesecake and rhubarb triangles, which are a type of flapjack.’ There is even a rhubarb festival each February. Place the cooked rhubarb, ginger, syrup and ice cream in the blender and blend until smooth. Pour into a glass over ice and garnish with extra rhubarb. 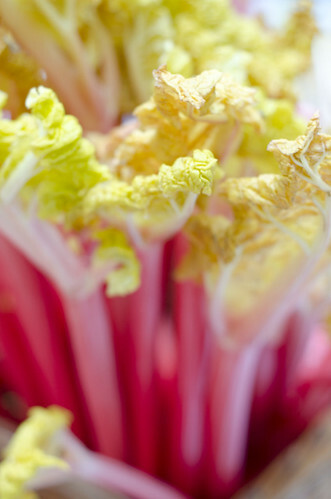 Yorkshire Forced Rhubarb has been elevated to the same status as Champagne and Parma Ham. Yorkshire Forced Rhubarb was awarded Protected Designation of Origin (PDO) status by the European Commission’s Protected Food Name scheme. Now we can ask Melton Mowbray ‘who ate all the pies? The recipe’s all in metric..? What about ounces as well for the benefit of us guys living in the UK? I agree it would taste better in imperial. Will try harder in future.